Composting is a great way to recycle, reduce and reuse waste, but it isn't always as easy as some make it seem. Here's a little secret: The key to successful composting is choosing the right type of compost bags. While some composting bags tear easily or don't hold much, ours are exceptionally strong and offer an impressive capacity. It's true. The extra thick 0.71 milliliter compostable bags each hold up to 2.6 gallons! 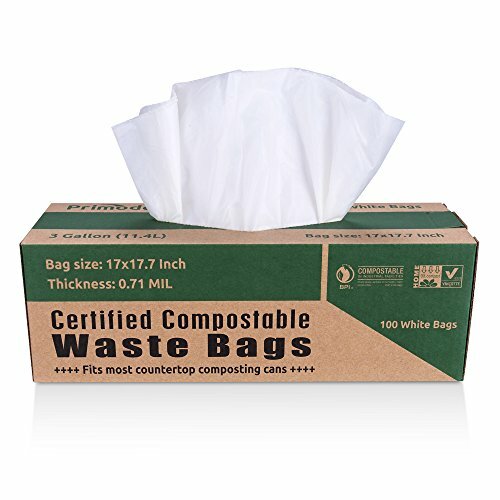 Use the 100% compostable bags in a small kitchen, in the break room at the office or in the cafeteria. 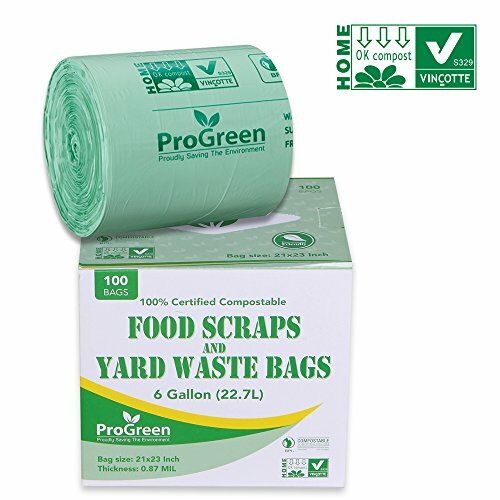 Each value pack contains (100) total composting sacks, so you should have plenty for many months to come. (We also carry the compstable bags in larger quantities if needed.) There are strict regulations placed on composting accessories, but our composting trash bags are completely compliant. This means you can safely use them knowing they won't sit in a landfill somewhere if tossed out. - 2.6 Gallon Capacity - 100 Count Box - Safe & Certified - Strong & Easy to Use Primode's compstable bags will change your life. Order your compost bag value pack now! Composting is a great way to recycle, reduce and reuse waste, but it isn't always as easy as some make it seem. Here's a little secret: The key to successful composting is choosing the right type of compost bags. While some composting bags tear easily or don't hold much, ours are exceptionally strong and offer an impressive capacity. It's true. The extra thick 0.71 milliliter compostable bags each hold up to 3 gallons! 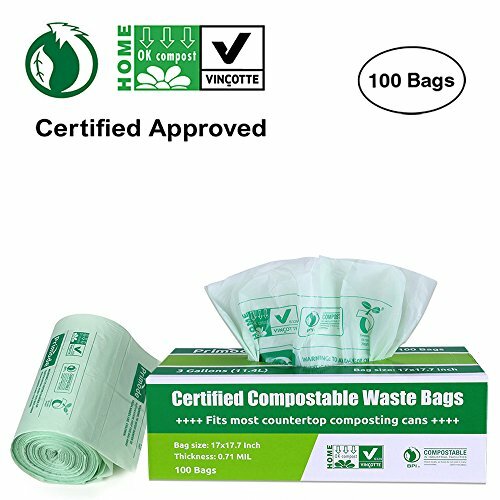 Use the 100% compostable bags in a small kitchen, in the break room at the office or in the cafeteria. Each value pack contains (100) total composting sacks, so you should have plenty for many months to come. (We also carry the compstable bags in larger quantities if needed.) There are strict regulations placed on composting accessories, but our composting trash bags are completely compliant. This means you can safely use them knowing they won't sit in a landfill somewhere if tossed out. The compost sacks also meet the requirements set forth by those who make suggestions for backyard composters living in urban environments. - 3 Gallon Capacity - 100 Count Box - Safe & Certified - Strong & Easy to Use Primode's compstable bags will change your life. Order your compost bag value pack now! Composting is a great way to recycle, reduce and reuse waste, but it isn't always as easy as some make it seem. Here's a little secret: The key to successful composting is choosing the right type of compost bags. While some composting bags tear easily or don't hold much, ours are exceptionally strong and offer an impressive capacity. It's true. The extra thick 0.87 milliliter compostable bags each hold up to 6 gallons! 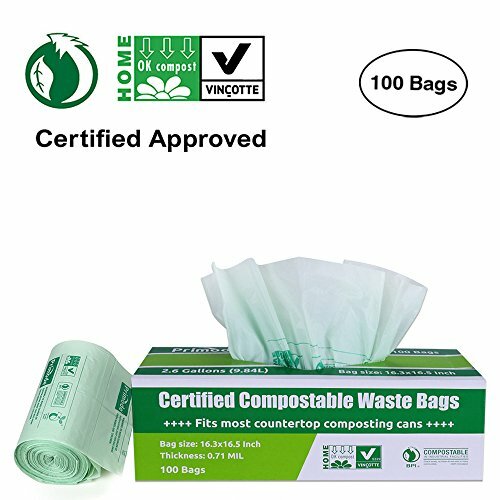 Use the 100% compostable bags in a small kitchen, in the break room at the office or in the cafeteria. Each value pack contains 100 total composting sacks, so you should have plenty for many months to come. (We also carry the compstable bags in larger quantities if needed.) There are strict regulations placed on composting accessories, but our composting trash bags are completely compliant. This means you can safely use them knowing they won't sit in a landfill somewhere if tossed out. - 6 Gallon Capacity - 100 Count Box - Safe & Certified - Strong & Easy to Use Primode's compstable bags will change your life. Order your compost bag value pack now! Composting is a great way to recycle, reduce and reuse waste, but it isn't always as easy as some make it seem. Here's a little secret: The key to successful composting is choosing the right type of compost bags. While some composting bags tear easily or don't hold much, ours are exceptionally strong and offer an impressive capacity. It's true. The extra thick 0.71 milliliter compostable bags each hold up to 3 gallons! 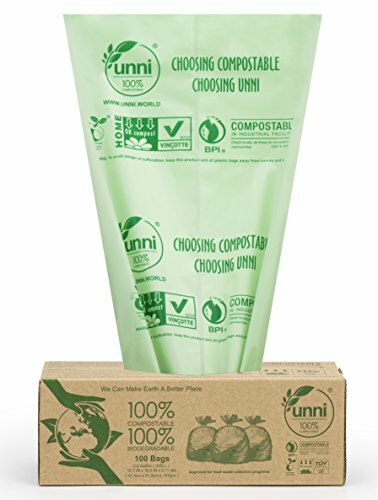 Use the 100% compostable bags in a small kitchen, in the break room at the office or in the cafeteria. Each value pack contains 100 total composting sacks, so you should have plenty for many months to come. (We also carry the compstable bags in larger quantities if needed.) There are strict regulations placed on composting accessories, but our composting trash bags are completely compliant. This means you can safely use them knowing they won't sit in a landfill somewhere if tossed out. - 3 Gallon Capacity - 100 Count Box - Safe & Certified - Strong & Easy to Use Primode's compstable bags will change your life. Order your compost bag value pack now! 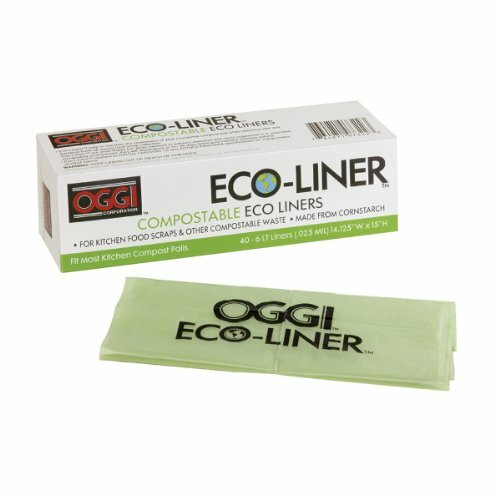 Oggi's eco-liner compost pail liners, fits most kitchen compost keepers. 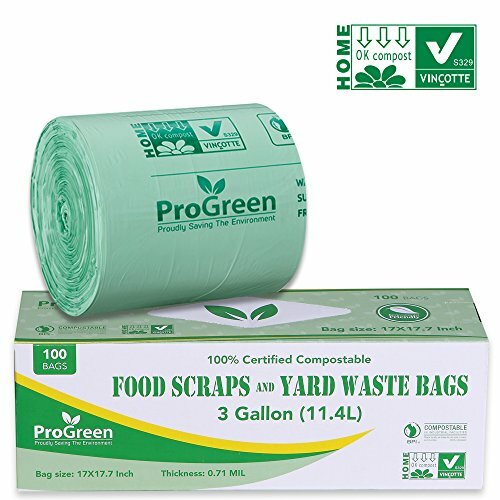 Use for kitchen food scraps and other compostable waste. Box of 40-6-liter liners. 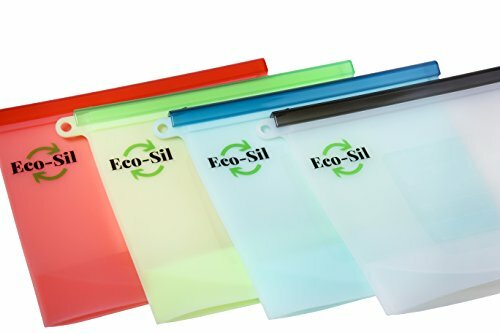 Looking for more Eco Plastic Bags similar ideas? Try to explore these searches: Lazy Spoon, Dial Micrometer, and Mens Tan Three Button Suit. Look at latest related video about Eco Plastic Bags. Shopwizion.com is the smartest way for online shopping: compare prices of leading online shops for best deals around the web. 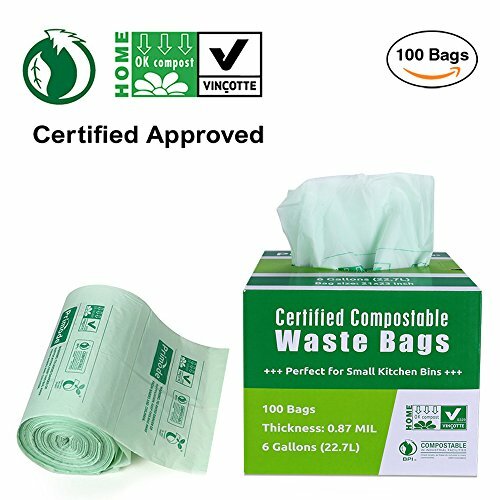 Don't miss TOP Eco Plastic Bags deals, updated daily.